Information Literacy is the set of skills needed to conduct research, locate authoritative sources and evaluate their usefulness for any given topic. 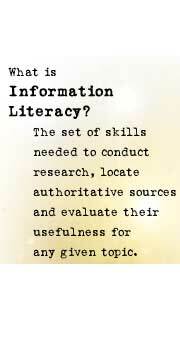 Put simply, Information Literacy can be thought of as learning how to learn. Further, the Association of College & Research Libraries states, “Information literacy is common to all disciplines, to all learning environments, and to all levels of education. It enables learners to master content and extend their investigations, become more self-directed, and assume greater control over their own learning. The concept of Information Literacy may seem too broad and overwhelming. Why should students learn all this? Because we want to remove the obstacles to creativity which are caused by lack of understanding of the research process. This is not just for college students but all of us, as professionals, in the workplace and in our personal lives. Being information literate ultimately improves our quality of life as we make informed decisions when buying a house, choosing a school, hiring staff, making an investment, voting for our representatives, and so much more."